Back cover blurb: Can you ever truly know the one you love? Fran Hall and her husband Nathan live in a farmhouse on the edge of the Fens with their two children. One February night, when Fran is woken by her baby, she finds the bed empty beside her and Nathan gone. Searching the house for him she makes a devastating discovery. As Fran finds herself under intense police scrutiny, she and her two small children become more isolated as she starts to doubt whether or not she really knew Nathan. Was he really the loving husband that Fran had trusted him to be? As police suspicion grows the questions for Fran begin to mount. Is there something that she is hiding from them - something that she has kept hidden from everyone, including her husband? From the author of The Crooked House comes another stunning psychological thriller about family, secrets and the lies we tell ourselves. 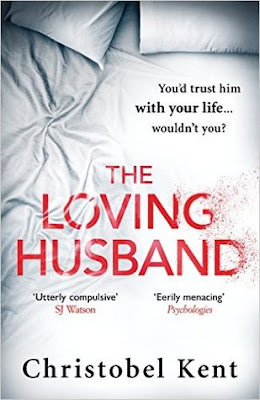 For fans of Gillian Flynn and domestic thrillers, The Loving Husband draws readers into a marriage where nothing is as it seems. Fran Hall wakes alone one night to the sound of her baby crying and her husband not by her side. She was certain that he had already returned from the pub, as she had felt his presence beside her and resented the fact that he hadn't got up to see to their baby. Alerted to a noise outside, Fran goes out into the cold dark night, to find her husband, Nathan in a ditch. The investigating Police Officers seem to have a deep seated suspicion about Fran. Why did the family move from London to the middle of nowhere? Did Nathan often go the pub alone? Was there something wrong with their marriage? Was Nathan violent? Fran denies all of their accusations. They moved because they wanted a quieter family life away from the hustle and bustle of London. Nathan went to the pub to relax, but despite what she tells the Police Fran's marriage was far from perfect. But then what marriage is? The local bumbling policemen (who add a nice touch of humour to this novel) are determined to find out. No matter what paths that might lead them down, and how unprofessional at times they may seem. The Loving Husband is a twisty, at times unsettling novel that will keep you guessing to its final pages. The Loving Husband is available from 1 September 2016. Thank You to lovereading.co.uk and the publishers who provided me with an advanced copy of this novel in exchange for an honest review.